The Coolpix S33 is the camera designed to withstand what your family throws at it. Family life is full of fun, laughter and sometimes a few bumps and bruises. The COOLPIX S33 is the camera designed to withstand what your family throws at it. Waterproof, shockproof and freezeproof†, it's ideal for the beach, the pool, skiing, amusement parks and other bumpy adventures. Oversized buttons and easy menus mean everyone can have a turn taking photos and Full HD videos. You can even create fun slideshows with sound right in the camera! 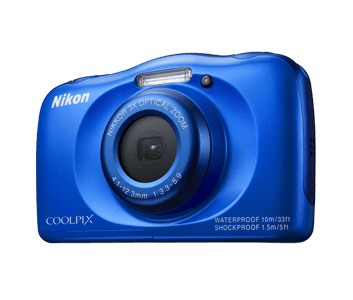 The Coolpix S33 is non-stop family fun. Fixed an issue that resulted in the camera interfering with nearby radios and other devices, possibly producing audible noise, when connected to the EH-73P/EH-73PCH charging AC adapter via USB with the battery inserted and the power off. This issue does not occur when the EH-71P/EH-71PCH charging AC adapter is used. The Coolpix S33 can go underwater down to 33 feet deep, withstand drops of up to 5 feet and can play in the snow at temperatures as cold as 14° F, so even the rough conditions won't stop you from recording precious memories. Safe to take to the beach, pool, playground and any place fit for family fun—you can always get a great shot of the action. Taking great photos and videos with the Coolpix S33 is so easy, everyone can have a turn using the camera. Its oversized buttons are friendly to hands of all sizes, and you won’t have to adjust any settings to get great shots—just point and shoot and let the camera do the rest. This is a camera designed with the whole family in mind. With the touch of a button, the Coolpix S33 becomes a versatile HD video camera. Record the sights and sounds as Full HD 1080p video with stereo sound you can enjoy for years to come. Add fun effects like Miniature, and make an entire scene look like a toy model. Then connect to an HDTV with the optional HDMI cable and enjoy your creations with the whole family. Every COOLPIX is designed around a genuine NIKKOR glass lens, the legendary optics that have helped make Nikon famous. The COOLPIX S33’s 3x optical zoom lens goes from wide-angle—great for portraits and landscapes—all the way up to telephoto—great for closeups of sports, concerts, nature and more. When you need even more reach, zoom up to 3x with optical zoom and 6x with Dynamic Fine Zoom, an enhanced digital zoom function that effectively doubles your reach.